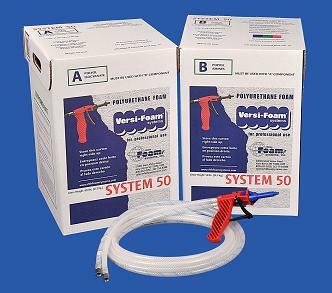 VERSI-FOAM CLASS 1 systems contain additional flame retardants. This formula is classified as Class I in accordance with ASTM E-84 with a 25 Flame Spread and a 225 Smoke Developed Rating. This means that the foam is flame resistant, it is not fire proof. These systems are suitable for use in inhabited buildings, including residential applications or any applications in which flammability is a concern. Versi-Foam is a very high quality high density foam. The systems come ready to use. No other equipment is necessary. The System comes with: the two chemical components, the patented U-CONTROL dispensing gun, 10 foot hoses, ten mixing/spray nozzles, 3 fan-tip nozzles, pair of nitrile gloves, petroleum pack, wrench and instructions. Contains No CFCs The System 50 is a LARGE size kit. The density of the foam is 1.75 pounds per cubic foot free rise or 2 pounds per cubic foot in place. The foam will expand six times its original volume and is tack free in 30 to 45 seconds. Theoretically, it will produce 600 square feet of cured foam at a 1" thickness, or 50 cubic feet.